If you’re lucky enough to catch Kanye West during his "Yeezus Tour," don&apos;t expect to see the emcee&apos;s face for very long. 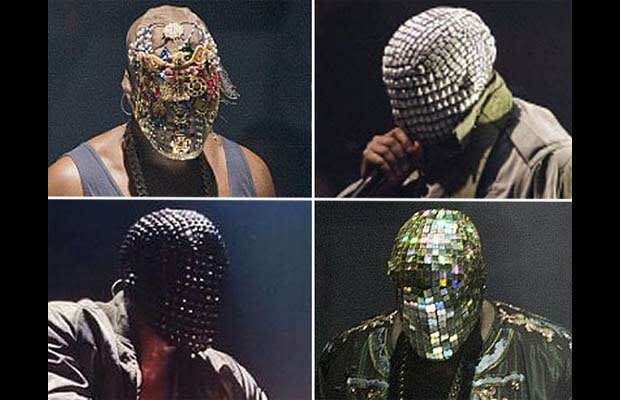 For most of the 2-hour long set that he played on the tour&apos;s opening night in Seattle, Yeezy went through a couple head-to-toe wardrobe changes, and in the process rocked a total of four masks. The masked movement is clearly still on and he’s upgraded from those crazy crystal-studded Mason Martin Margiela and the "Kanyeti" joints he rocked last year. The rapper wore pieces that look like relics perfect for temple Yeezus. These decorative disguises were set with mirrored tiles, black studs, and shiny gems. We just hope these masks are well ventilated. It gets hot up there under all those lights, even when your pants rip open to give you a breeze. We’re digging that Kanye puts so much effort into all the details of creating a true spectacle that will definitely be worth the price of admission. Did you see the damn Wes Lang collaborative merch being peddled? He is not playing around. So far, all indications point to the "Yeezus Tour" being an awesome display of showmanship we rarely see from male rappers these days—but most probably don’t have the same budget as Yeezy. Expect to see more wild disguises as the tour goes along. Here&apos;s a couple ideas we have our bets on.